While it has been decades since HIV/AIDS was a frequent topic of national headlines, and medical advances have greatly reduced the threat of death associated with the disease, it remains a factor in metro Atlanta and in Cobb County. The number of HIV patients entering a local treatment program has increased in recent years, and the issue is especially prevalent in certain portions of the county. There were 76 AIDS-related deaths in Cobb County between 2012 and 2016. The highest number of deaths, five, occurred inside a single census tract, No. 13067031311, near Six Flags Drive and just north of I-20. The same census tract recorded an alarming infant mortality rate during the five-year period. Metro Atlanta has among the highest rates of new infections in the nation, and the southeast generally has the most people living with HIV and AIDS. The southeast also suffers some of the nation’s highest poverty rates, the highest rates of sexually transmitted infections, the greatest number of people without health insurance, the least access to healthcare and the fastest-growing HIV epidemic in the nation, according to the Southern AIDS Coalition Board of Directors. Even affluent counties like Cobb are not immune to these issues. Capstone Health is the clinic that oversees the Ryan White HIV/AIDS Program at Cobb & Douglas Public Health (CDPH), named for Indiana teenager Ryan White, who died of AIDS in 1990 and played a large role in changing perceptions of the disease. The program provides HIV-related services across the country for people without health care or necessary financial resources, and is administered by the U.S. Department of Health and Human Services. The number of HIV/AIDS patients enrolling in the program is far from encouraging. According to recent data received from Cobb & Douglas Public Health, the clinic’s patient load increased from 628 in 2010 to 774 during the past year, a 23 percent jump. Statistically speaking, this means more HIV positive patients are engaging in care, though it isn’t necessarily indicative of an increasing number of new HIV infections. Dr. Yvonne L. Carter, director for infectious diseases, leads a team that cares for those patients who are living with HIV/AIDS, and said the job comes with many challenges. “From a very broad perspective, the challenge lies in specific stages of the HIV Care Continuum,” said Carter. That continuum includes diagnosis, engagement with the patient and clinic staff, and retention. Carter’s focus is on a team approach, she said. For HIV/AIDS, the team comprises behavioral health professionals, along with physicians, nurses, epidemiologists and others. “Capstone Health uses state and federal funding to provide support HIV/AIDS services, which minimize barriers to care, and ultimately boasts one of the highest viral load suppression rates in the metro Atlanta area,” said Carter. Viral suppression means a patient has very low levels of HIV in their blood. It is achieved through medication management, though patients must continue taking medication because even very low levels of HIV do not mean a person is cured. HIV is still in the body, a message infectious disease experts say needs to get out. Although the number of HIV/AIDS diagnoses are higher in Fulton and DeKalb counties, HIV in Cobb County is a significant health concern as well. 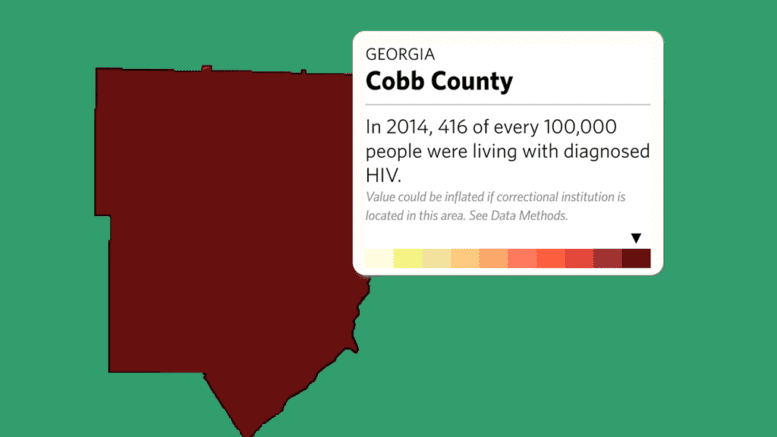 According to AIDSVu, an interactive online map depicting the HIV epidemic in the U.S., in 2014, 416 of every 100,000 people in Cobb were living with diagnosed HIV. The rates were greater in Fulton (1,491 of every 100,000) and DeKalb (1,114 of every 100,000), but significantly lower in neighboring counties such as Paulding (114 of every 100,000) and Cherokee (132 of every 100,000). Black males are 4.7 times more likely to contract HIV than white males, and black females are more than 14 times more likely to contract HIV than white females, according to AIDSvu. The increased number of Cobb & Douglas Public Health HIV patients suggests a growing and increasingly diverse population in Cobb, according to state and local officials. Capstone’s clinic is located in the Marietta Public Health Center. In 2014, the Georgia Department of Public Health (DPH) HIV Disease Surveillance Summary indicated Georgia is ranked fifth in the nation for number of persons living with HIV. Two-thirds of Georgia’s HIV patients live in the Atlanta Metropolitan Statistical Area. Communities with high poverty, income inequality and a lack of health insurance are at a higher risk of being impacted by HIV, according to AIDSVu data and those who work in the HIV/AIDS communities. Research shows early treatment of HIV can decrease the risk of transmission to a partner by as much as 93 percent, according to AIDSVu’s website. Male-to-male sexual HIV transmission accounts for more than 43 percent of Cobb cases, according to a 2010 AIDSVu report, with black men ages 18-24 particularly affected. Be the first to comment on "Number of people entering treatment in Cobb County HIV/AIDS treatment center on the rise"